THIS SATURDAY AFTERNOON! Junebug Productions is proud to present the inaugural installment of our new place-based storytelling performance series, HOMECOMING PROJECT, where YOU are the stars! Be a part of the process, be a part of the show - bring the whole family, bring the whole neighborhood - as we lift up our unique cultural heritage and take it to the streets so that we may preserve and continue our traditions that make New Orleans HOME. HOMECOMING PROJECT will feature performances from the Hot 8 Brass Band, Kumbuka African Drum & Dance Collective, Michaela Harrison, Roscoe Reddix Jr, Keisha "Peaches" Caldwell, VOIC'D (Voices Organized in Creative Dissent), and more surprises along the way! Street art installations created by the Xavier University art students, under the direction of renowned New Orleans visual artist, Ron Bechet, will be unveiled along our Second Line route, and Institute for Womens & Ethnic Studies (IWES) will host a FREE Community Health and Resource Fair at the finale of the Second Line at the New Orleans African American Museum. Additionally, documentarian, Royce Osborn of All On A Mardi Gras Day will be filming HOMECOMING PROJECT - be a part of history - be there! Tell us what HOME means to YOU. For more information, or if you are interested in participating in or supporting HOMECOMING PROJECT, please contact us! 12:00pm: Welcome & Libations @ Congo Square - 800 N. Rampart St.
12:30pm: Second Line begins northeast on N. Rampart St.
3:00pm: Second Line dis-bands @ 1418 Governor Nicholls St. Featuring the sounds of The Dynamite DJ Dave Soul + MC Charlie V! Join the cast and crew of Junebug and Homecoming Project in celebrating home with Dave Soul on his 33rd birthday. + Visit Golden Feather for delicious traditional African and Creole foods for dinner from 6pm - 9pm downstairs! 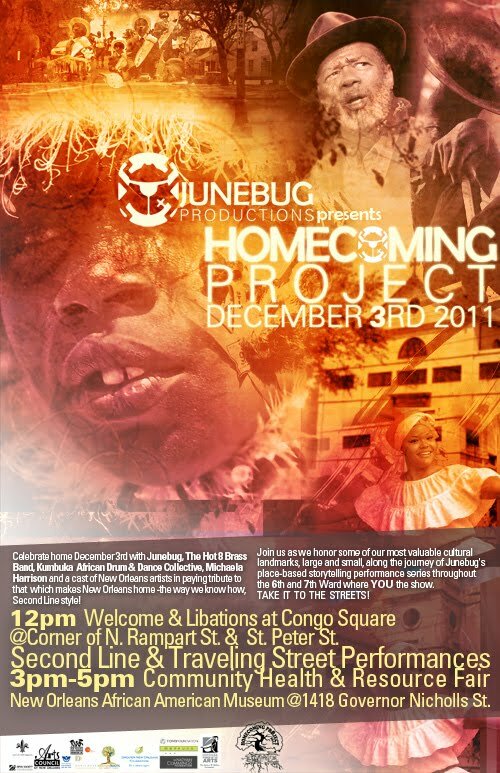 Join us after the inaugural Homecoming Project 2011, happening from 12pm - 5pm in Treme on Saturday, December 3rd, in supporting New Orleans' historical community theatre organization, John "Junebug Jabbo Jones" O'Neal's Junebug Productions, at our seasonal fund-raiser and dance party! This year, Junebug has joined forces with Dave Soul and Pont:Productions for our holiday fundraiser to help sustain one of New Orleans' cultural gems with another cultural gem - DJ Dave Soul - on the 1s and 2s for his 33rd Bornday Party! Why not support our own legacy and cultural preservation this holiday season AND have a good time doing so? We can't think of a better way. HOMECOMING PROJECT 2011 is made possible with the generous contributions of grants from: the Arts Council of New Orleans, Louisiana Division of the Arts, National Endowment for the Arts, The City of New Orleans, Nathan Cummings Foundation, Creative Capital MAP Fund, Theatre Communications Group, Doris Duke Charitable Foundation, Andrew W. Mellon Foundation, New Orleans Jazz & Heritage Foundation, Greater New Orleans Foundation, Gulf Coast Fund, Open Society Foundations, and Alternate ROOTS. Junebug Productions & Homecoming Project would also like to extend very special thanks to our community partners; Ashe Cultural Arts Center, Contemporary Arts Center, The New Orleans African American Museum, Institute for Womens & Ethnic Studies (IWES), The Black Men of Labor Social Aid & Pleasure Club (BMOL), Golden Feather Mardi Gras Indian Restaurant & Gallery, The Center for Public Service (CPS) and Students Organizing Against Racism (SOAR) at Tulane University, the Xavier University Art Department and Art Village, Mondo Bizarro, ArtSpot Productions, Kids ReThink Our Schools Program, Safe Streets, People's Institute for Survival & Beyond (PISAB), People United for Armstrong Park (PUfAP).